There was, without doubt, a spring in the step of SES Romain Bausch as well as other senior staff at the recent Satellite 2013 event in Washington DC. The reason revolved around O3b, which sees the first four satellites emerge from their Thales Alenia manufacturing facility in Cannes over the next few days, prior to their transfer to Arianespaces Guiana spaceport with a Soyuz launch vehicle scheduled for the end of May. A large part of my focus has been (and still is) on maximizing the synergy between the different component organizations that, to varying degrees, provide the product and service offerings of Globecomm Maritime: Telaurus, Globecomm Europe, and Globecomm South Africa. No, you did not mistakenly pick up a legaljournal with an article written for attorneys about the disolution of married couples.However, we will discuss some similarities between marriage and employment within the context of leadership and best practices recruiting. When it comes to smartphones and tablets, we only have to sit down in a café or in an airport departure lounge to realize how indispensable these devices have become in our everyday lives. Terry Neumann is part of the market development team within iDirect. He focuses his time and resources on promoting and expanding the use of VSAT and iDirect technology in specific vertical markets. He has been supporting the maritime market for the past 5 years and evangelizes the benefits of VSAT for maritime connectivity. He works closely with a number of the top maritime satellite service providers in the industry that rely on iDirect as their primary platform for delivering differentiated services. There is no doubt that the maritime industry is increasingly vital for a plethora of resources for industry, commerce, and leisure. Indeed, 70 percent of the Earth is covered by oceans and we rely heavily on the maritime industry to transport globalized trade goods, supply food and energy, as well as providing us with entertainment. With increasing importance, however, comes the need to communicate effectively while at sea. Kim Gram has held the position of Vice President of the Aeronautical Business Unit at Cobham SATCOM (previously Thrane & Thrane A/S) since 2009. Kim has commercial responsibility for the global aeronautical business of Cobham SATCOM. He has been an integral part of the company for more than 12 years, having joined Thrane & Thrane A/S in 2001 as Sales Director, Global Maritime Sales. He held this post for two years, during which time he oversaw the introduction of the first data product of the company. Traditionally, communications with ships on the high seas was conducted by morse code or by via radio communications when ships were within range of a receiving station. The start of the space age in 1957 saw the gradual introduction of communications satellites, although initially, large receiving antennas were required. LEON: The Space Chip That Europe Built, An advanced 32-bit microprocessorengineered and built in Europe. Similar to home computers, the sophisticated capabilities of todays space missions are made possible by the power of their processor chips. ESAs coming Alphasat telecom satellite, the Proba-V microsatellite, the Earth-monitoring Sentinel family, and the BepiColombo mission to Mercury, are among the first missions to use an advanced 32-bit microprocessorengineered and built in Europe. All of them incorporate the new LEON2-FT chip, commercially known as the AT697. Engineered to operate within spacecraft computers, this microprocessor is manufactured by Atmel in France but originally designed by ESA. 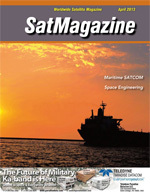 Satellite communications usage at sea typically reflects trends on land and, today, more than ever, the maritime community is relying upon connectivity to increase operational efficiency as well as to support passenger and crew welfare. However, in order to offer a similar connectivity experience as those experienced in the home or officeenabling access to social media, email & Internet as well as free or low-cost contact with family and friends while at seaservice providers must offer an efficient balance between cost, coverage and performance.